New York, March 25: Democrat Senator Kirsten Gillibrand, speaking outside a Trump-branded high-rise in Manhattan, launched an attack on President Donald Trump, calling him a "coward" and the building bearing his name "a shrine to greed, division and vanity". The speech by the New York Senator on Sunday, part of what her campaign billed as the official kick-off of her 2020 presidential bid that has unofficially been underway since January, appeared to be a calculated effort to elevate a candidate who has so far struggled for traction and attention in a crowded Democratic field, The New York Times said. US Presidential Elections 2020: Kamala Harris Calls for Funds to Hike Teachers' Pay. The crowd on a closed-off Central Park West was small compared with those drawn by her rivals over the weekend. Senator Bernie Sanders of Vermont attracted upward of 10,000 people in Los Angeles, in the home state of Senator Kamala Harris. 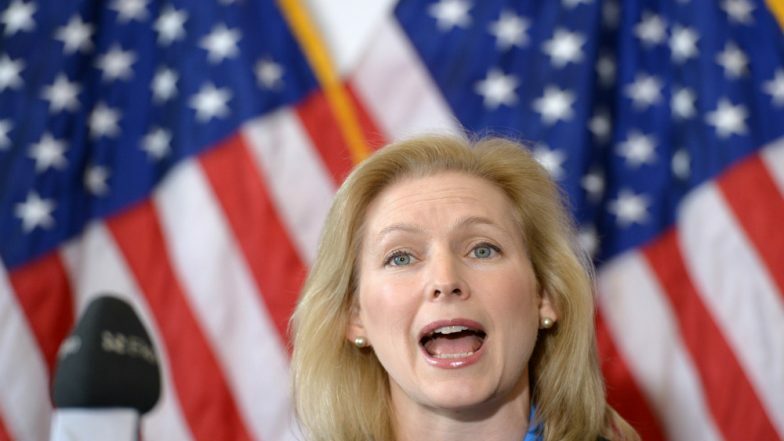 Most polls nationally, and in early states, have shown Gillibrand drawing around 1 per cent support. Still, that is enough to meet the low threshold the Democratic National Committee has set to make the first debates later this year.